The Kind of Face You Hate: Why Didn't You Help Me? Stuart Gordon’s Stuck is based on the true story of Chante Jawan Mallard, who, one night while driving drunk and high on Ecstasy, ran into Gregory Glen Biggs with such force that his body was thrown halfway through her windshield. Instead of stopping, she drove home with Biggs, who at this point was still alive, stuck there. She parked her car in her garage and left him, where he died about two hours later. Which means there was plenty of time to save his life, but Mallard, a nurse, never called anyone to help. Until after he’d died, that is, at which time she sought help from her brother who helped dispose of the corpse. This was in 2001, and was a big news story, as tends to be the case when someone behaves in a fashion either so brutal or so callous that most people (let’s hope) have a hard time even processing the information. The case was mined for TV episodes here and there, but the only person to approach it cinematically is Gordon, he of Re-Animator and From Beyond fame. Though Stuck is regularly categorized as a horror film – and the material could certainly have been used that way – it’s closer to Edmond among Gordon’s work, and is still different from that film in that it is really a crime film (a fact which would seem to pair it off naturally with Gordon’s King of the Ants, except that nothing pairs off naturally with King of the Ants) about, as so many crime films are, moral decay. Very sudden moral decay, moral decay depicted via time-lapse photography. In the film, Mena Suvari plays Brandi (Stuck is heavily fictionalized, so the characters’ names have all been changed and so forth), a nurse at an elderly care facility, as was Mallard. Intriguingly, she is shown early in the film to be good at what she does, and caring. This is done in a very Stuart Gordon-ian way by having one of her patients defecate in his bed, a regular occurrence, the nasty clean-up of which the patient always insists be done by Brandi (not out of any kind of demented cruelty, we gather, but because she is a comforting presence for the old man). I can’t really imagine doing a job like that, day after day, so from where I sit Brandi, at this early stage, occupies a higher plane of selflessness than I can claim for myself. She doesn’t perform this task, or any part of her job, with huffy disdain, but as warmly and professionally as she can. She is good enough at her job, in fact, that her boss (Carolyn Purdy-Gordon) hints that she is being seriously considered for a promotion. But as we will soon learn, Brandi is nowhere close to being perfect. In her off hours, she associates with drug dealers, such as her boyfriend, Rashid, played by Russell Hornsby. 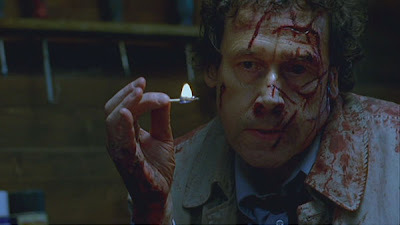 It is after a night of revelry, or debauchery, depending on how you approach such things, that Brandi thinks nothing of driving home high and intoxicated, and plows into Tom (Stephen Rea), whose sad state of affairs, which includes joblessness and homelessness, has been playing out in parallel with Brandi’s day. Outside of one homeless man (Lionel Mark Smith), among whose ranks Tom now finds himself, no one has treated him with any kindness on the day that would appear to be his last. He’s been given several choices – by his awful landlord, by an obnoxious case worker at a job interview – that offer no choice at all. Vacate your apartment and leave all your belongings until you can pay the rent, or else. Fill out and mail in the form that got you this interview in the first place, but which has been lost, or have no shot at the job. 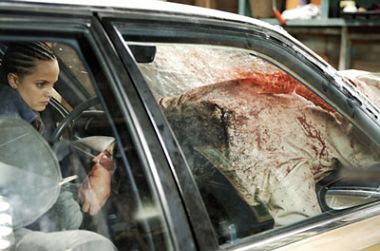 Now that he finds himself near death and pinned by broken glass in Brandi’s windshield, the choice is all Brandi’s. And of course, she considers it no choice at all: go to prison, or let the man die. Here is where Stuck deviates pretty drastically from the case of Mallard and Biggs, because Stephen Rea's Tom doesn't die. As Brandi goes about her life, albeit more hysterically and more recklessly, Tom, his legs shattered, struggles to live. This is not to imply that Biggs didn't do the same, but that he probably couldn't. Gordon makes it possible for Tom to survive as a way to gain for Biggs some measure of revenge. I don't claim to know that Stuart Gordon was trying for this, but Stuck works that way all the same. Stuck becomes a film about moral choices, which should go without saying, and it carries a strong contempt for those who refuse to make them. I'll mention here that the film came under some small amount of fire, from various quarters, for changing the race of the female perpetrator -- Mallard was black, Suvari is white -- but any hint of PC cowardice that you might think is implied by this choice is washed away by actually watching the film. But never mind why -- I'll go ahead and continue to assume things about Gordon's motives and say that to introduce the race issue would be to confuse the issues Gordon cares about. Stuck is a film that is neither PC, nor interested in appearing ostentatiously un-PC. 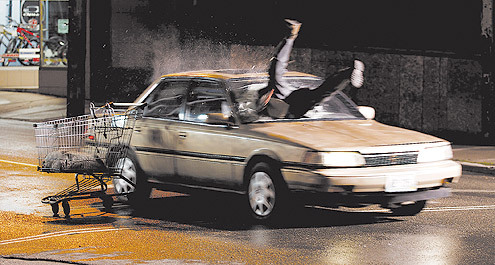 It's an angry film that refuses to set up easy targets (except for maybe the landlord and the job interview guy, but it's necessary to depict Tom at his lowest point when the car hits him). He does this by pulling from Mallard's life the fact that she was a nurse and caregiver who is outwardly good and helpful and selfless, but only so long, perhaps, as she's paid to be that way. It may not even be that cynical, though. It may simply be a touch more misanthropic. To paraphrase Chinatown, Stuck could simply be acknowledging that in the right place, and in the right time, people are capable of anything. You're only as good as the choices you've been forced to make. It's not hard to understand the difficulty of Brandi's choice, and lesser circumstances have driven people to murder before, but as Tom is reminded again and again, sometimes, even when presented with two distinct choices, you have no choice at all. Brandi (and Mallard) had to choose between their own well-being at the expense of another, and saving a life in an act that would land her in jail. Morality demands only one option. The most bracing aspect of Stuck is its revenge-from-beyond-the-grave ending. Tom lives, and escapes, and brings down, both directly and indirectly, those who would let him die (or murder him outright). His choice in the film is death or self-preservation, and finally self-defense. When faced with the option of killing someone who he's now rendered helpless, he doesn't do it. But that person, the one who is helpless before him, dies anyway because they still can't face the consequences. This act is not like all those films where revenge comes after the hero has removed the gun from the villain's head and grunted "You're not worth it! ", only have to have Gary Busey or whoever pull a gun at the last second, giving the audience the death they wanted without the taint of revenge. It's an awfully craven way to go about depicting revenge -- I'm perfectly happy, and entirely prefer, my revenge to be straight-up. But in Stuck, Brandi's fate is sealed by her character. Everything she does, including the last thing she'll ever do, follows logically from her decision to drive home with a dying man stuck in her windshield. Once that kind of selfishness takes hold of one's nervous system, it can be hard to shake loose. So in Gordon's world, Biggs gets to live, and Mallard, who is still in the first long chunk of a very long prison sentence, has to endure more than she did in reality, and who can blame you for thinking what Gordon has imagined is only fair?